Eyes aren’t the only human organ that can “see” light. It turns out that skin cells called melanocytes have a light-receptor molecule called rhodopsin that fluoresces as soon as it detects ultra-violet A light (UVA), the deeper penetrating, long-wavelength UV light, as shown here. Until now, researchers have only found rhodopsin in the eye, where it helps the eye adapt to low-intensity light and is an integral first responder to the perception of any light. When light strikes rhodospin in the retina, rhodopsin reacts by chemically breaking down, which triggers a nerve signal. In melanocytes, rhodopsin has a different, but extraordinary role. 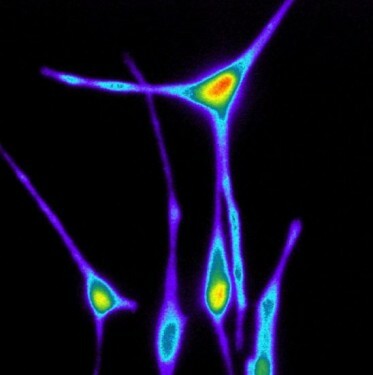 The rhodopsin causes the cells to fluoresce in response to UVA light while triggering an early, important step in melanin production: a spike in calcium signaling. Melanin — the skin pigment that absorbs radiation and produces a tan — protects DNA in skin cells from UV damage. Previously, scientists thought melanin production began long after radiation damaged the skin. Now it seems that the process of producing melanin begins as soon as the skin “sees” radiation through its light-recepting molecule!